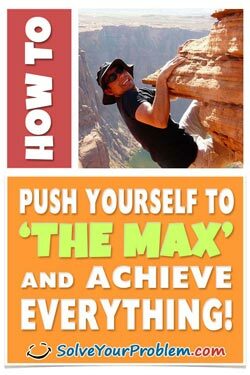 Album: Success-Happiness Push Yourself To THE MAX and Achieve Everything! If you have ever found yourself holding back on something you really wanted to do, you are familiar with self-limiting beliefs. What's more is that your beliefs are the foundation upon which your entire life rests. This foundation was formed by your childhood conditioning, the experiences you've had during the course of your life, and the conclusions you've drawn as a result of them. Every action (or non-action) you've taken during your lifetime has been encouraged or discouraged by these beliefs. Do you see the pattern of destruction and the dimmed potential that results from it? For most of us, it takes only ONE negative experience to start an avalanche of massive proportions. BUT, hear this: your beliefs are malleable and flexible! When you really start to get this, life becomes very exciting. Suddenly a whole new world opens up to you, a world in which anything & everything is now possible. It's time that you life life to it's fullest. It's time you learn to live life to THE MAX...STARTING RIGHT NOW! Download my awesome and super energizing guide today!